Thread: Did agriculture develop thanks to the original carriers of macro Y-haplogroup K ? The only major haplogroup under K that is not listed is R1a, which most likely represents the people who managed to domesticate of the horse. - Farming and animal husbandry did not develop independently anywhere else in Africa (hg A, B and E), but was brought by migrations of E1b1b, R1b-V88 and T people from the Levant. The only region that could be thought of as agricultural pioneers is the Horn of Africa (Ethiopia & Somalia), where camels where apparently first domesticated. This region has the world's highest frequency of haplogroup T.
- The Dravidian population (hg H) of South India failed to develop agriculture despite having a more propitious natural environment than Papuans or Incans. - The Jomon Japanese (hg C and D) kept a lifestyle of hunters, fishers and gatherers later than nearly any other society in Eurasia (apart from isolated tribes in the jungles of South Asia or in the Arctic region) despite the fact that they lived in a temperate to subtropical region with some of the most fertile soil on Earth (thanks to the volcanoes). - The most perplexing case is that of Mesolithic Europeans (hg I and possibly C and F), who lived in an environment highly favourable to both farming and herding, but failed to develop agriculture by themselves. Agriculture had to be brought by Near Eastern migrants and only reached western and northern Europe 5000 years after agriculture had been developed in the Fertile Crescent, the Indus, Valley and the Yellow River, and even 3000 years after Papuans developed agriculture in their jungle highlands of New Guinea, where it is much harder to cultivate anything than in Europe. This makes me wonder whether the original carriers of Y-haplogroup K possessed some genetic qualities of predisposition that helped them domesticate plants and animals ? Aboriginal Australians, who belong mostly to hg C but do have about 20% of hg K*, did manage to grow some plants (yams, bush onions, millet ), but failed to develop any form of widespread or sustainable agriculture - perhaps because they possessed only a tiny percentage of original Central/North Asian autosomal genes from their Y-DNA K ancestors. It could also be argued that the E1b1b people who developed agriculture in the Fertile Crescent originated in the Horn of Africa, where they might have blended extensively with haplogroup T. Unless of course haplogroup T was not yet in Africa before the Neolithic, in which case E1b1b and G would have mixed with T and R1b in the Fertile Crescent itself. Either way, it is almost certain that agriculture in the Fertile Crescent arose from a mixture of these four haplogroups, two of which descend from macro-haplogroup K.
So far it remains unclear whether haplogroups J1 and J2 had anything to do with the early development of agriculture in the Fertile Crescent or if they were assimilated by the advance of Early farmers like haplogroup I in Europe. If J1 and J2 people had been part of the original Neolithic expansion, both haplogroups should be expected to be found in agricultural populations in various parts of Africa alongside E1b1b, G, R1b and T. But the only ethnic groups in Africa where haplogroup J is found are all Muslim and the presence of J can be solely attributed to the expansion of Islam since the 7th century. In Europe and South Asia, I believe that haplogroup J2 spread mostly during the Chalcolithic and Bronze Age rather than during the Neolithic (even if a small percentage of J1 and J2 could have infiltrated the population of early farmers and herders before they left the Middle East). Last edited by Maciamo; 03-12-13 at 19:29. There seems to be a connection between Fertile Crescent and Indus civilization : Mehrgarh. It looks like the Idus Valley civilization was an ofshoot of Fertile Crescent. I agree with your observations here above. But would that mean that haplo K and their descendants kept that advantage for more than 30000 years? - a genetic mutation changing the brain structure, especially if K mixed with Neanderthals in Central Asia more than other Homo Sapiens did anywhere else, as I believe they did. - a difference in genetic temperament that would make them more likely to seek a sedentary lifestyle or to live alongside tamed animals. - a unique set of HLA genes (immune system), which make them more tolerant to a diet based on cereals (like HLA-DR11) or more resistant to diseases acquired by living in close proximity to animals. There may be others too, but you get the idea. Such advantageous genes would have quickly spread to other populations once descendants of haplogroup K mixed with them. However their presence would have been essential in any population that were to start an agricultural lifestyle. 1. The origin and use of infant swaddling and diapering which appears to be, or restricted to early P-M45 innovation. This innovation is important because it freed women to have children on a calendar year basis as opposed to a triennial basis in many primitive societies. In R* descended societies the nanny goat was another important step that freed women to have more children. Childhood birthweight, mortality, numerical dominance and other statistical factors are most likely to explain the explosive growth of R and Q. 2. Deep water sea faring. Exclusively the domain of MNOPS. 3. Fishing equipment. Possibly K.
4. The domesticated dog. Possibly P-M45. 5. Earliest Metallurgy and proto-written language. Possibly early P-M45. 7. Ceramic pottery. Possibly NOPS. Agriculture? One thing is certain, the dates in the Americas and Asia have been pushed back to almost identical times as that of the Fertile Crescent. Given the relatedness of the haplogroups responsible at that time, it would seem reasonable to conclude a single culture was responsible for the innovation. The multi-origin theory of agriculture is, I think, lazy anthropology. I don't know much about the history of diapering, but if that innovation came about with hg P, then it could indeed explain its fast population expansion. Would you care to elaborate ? Haplogroups NOP spread essentially on land. Only M and S used boats to reach New Guinea, but so did the hg C people before them. I doubt it. Cro-Magnons fished and didn't belong to K.
The latest evidence is that dogs were domesticated in Europe 18,000 to 32,000 years ago, so by Cro-Magnons, not by K. Neanderthals had domesticated dogs before them too. As I explained here, I believe that haplogroup J2 was the main lineage responsible for the early metallurgy. If it weren't them, copper and gold metallurgy arose in Anatolia and the Balkans before the Indo-European migrations, so it wouldn't have been invented by haplogroup R1a or R1b anyway. Perhaps, but what advantage does it confer ? Possibly hg NO. However the earliest known pottery dates from the Gravettian period (29,000–25,000 BCE) in Central Europe and is therefore linked to Cro-Magnon. The oldest known widespread use of pottery is among the Jomon Japanese, who belonged to haplogroups C and D.
Ok, but again why would they constitute evolutionary advantages ? I've always suspected that agriculture developed as a result of a stationary and growing population of hunter/gatherers needing to increase the resources available to them so that they could remain stationary. In other words, agriculture could only develop in some fertile river valley where there were lots of fishing and plant resources available for one group to stay put for quite a while before they developed agriculture. And a society would also have to have developed cultural values that favoured innovation in order to come up with farming as a solution to such a problem. I think herding is a bit different in that, while it could be an offshoot for farming in some cases, it could also have been developed separately by people living in open grassland areas - I doubt if arctic reindeer herders were influenced by farmers. So perhaps the development of agriculture owes more to geography and circumstance than to the genetics of certain groups of modern humans. Then why did agriculture arise in the highlands of New Guinea and in the Andes, but not in Japan or Europe ? Agriculture had already sprung up across the Fertile Crescent and Indus Valley before the climate in Europe was even fit for agriculture, this could explain why the first agriculture in Europe popped up in the southeast with the arrival of middle eastern lineages. Perhaps Japan and Europe didn't have sufficient population to necessitate the development of agriculture prior to invasions by agriculturalists, while South America and New Guinea remained isolated long enough that larger populations could develop along coastal regions to the point where the choices were either agriculture or large scale migration, in geographic settings where large scale migration would have been difficult. And in South American, as in Babylon, the development of a strong and structured priesthood that liked to build religious monuments may have encouraged the development of a centralized population. I know that last argument doesn't work for New Guinea, but it had a long time to develop enough population density to need agriculture. I see the development of agriculture as a response to population density, as well as being a driver of population density. But non-agricultural populations won't build up to the point where they need agriculture unless the environment can support an increasing population for a while without it, IMO. Nomads don't generally plant crops. There was definitely a connection between the fertile crescent, Indus Valley and East Asia but I doubt that farming evolved independently in multiple areas of the world. More likely farmers from fertile crescent migrated to Indus Valley and from there to China. And from there to where? South America? No. Farming was invented separately in at least two places, and possibly more. Why not? Even until 4000 BC the sea level of the Bering is believed to have been low enough for Human to cross from Asia to America. So why shouldn't some farmer in East Asia crossed the Bering into America? I mean it's not like this idea is something new. Old ideas can be improbable too. And archeology is pushing back the time of the beginnings of archeology in South America and Mexico, and creating a picture of people in those areas developing agriculture as a means of increasing yield from crops they were already harvesting. Of course, my idea doesn't invalidate what Maciamo is saying about K. It is kind of curious. Wait a second, can't agriculture in India be linked to the men of y-DNA H which directly descends from F? Also, I know that both y-DNA I and mtdna U/H in Europe are linked to either aurignacian culture or gravettian culture, are you telling me Gravettian culture was linked to Neanderthals? Oh, gravettian culture was linked to cro-magnon's not Neanderthals, sorry XD; were these cro-magnon's the y-DNA I men by any chance? Perhaps, but what advantage does it confer? Possibly prestige among high ranking males. In tattooing cultures such as the Polynesians or Amerindians, tattoos often indicate rank and experience that begins in adolesence and progresses as a man's status increases or having demonstrated meritorious action such as bravery in battle. This was probably also true in ancient Japan or Ainu/Okinawans. I would argue this indicates a shift towards increasingly centralized and hierarchal chiefdoms and merit based societies. It appears that most MNOPS people were tattooed, but not all, and other peoples also potentially tattooed such as the Gravettians and I'm sure it diffused into other populations. So I would chalk this up only as an 'item of interest' worth further investigation. That may be true, but in any case appears spread across North Eurasia after the initial domestication. However the earliest known pottery dates from the Gravettian period (29,000–25,000 BCE) in Central Europe. Ceramic technology as in art and figurines, but not true utility wares as in Asia. Depending on who the Gravettians were genetically, possibly an older association can be known. But it seems that true ceramic pottery spread to the West during the Pre-pottery Neolithic. Haplogroups NOP spread essentially on land. Only M and S used boats to reach New Guinea, but so did the hg C people before them. I think the jury is still out on this. O & K, are found in Polynesian peoples such as the Hawaiians. The peopling of the Americas, especially the Western coasts is still not totally understood. R1b may have spread via waterways in Europe, North Africa and the Near East. You mention haplogroup C, which strangly appears in almost all these places in Asia, the Pacific and the Americas but not in West Eurasia. Ok, but again why would they constitute evolutionary advantages? is used to trace the origin of haplotypes. The two can compliment each other. Therefore, infant swaddling could have originated amongst R and Q peoples in a proximity zone or its ancestor P-M45. Of course, I don't take a dogmatic view on swaddling or any of this. I just find some of the correlations interesting, especially those between West Asia and the Americas. The two are so far removed and isolated, yet both appear to retain cultural aspects from a very distant past. This makes sense , but you need to explain the reason the early G and I markers did or did not do? New Guinea first developed agriculture around 7000 BCE. Population must have been very sparse at the time. Agriculture did evolve independently in various parts of the world. The American continent and New Guinea are proof enough. As for China, Cui et al. 2013 tested 47 Neolithic Y-DNA samples from the West Liao River Valley, Northeast China and the haplogroups turned out to be exclusively East Asian (N1, C/C3e and O3a). In any case there is no evidence of migration from West or South Asia to China in Early Neolithic times, either from ancient DNA or from archaeology. Chinese pottery also pre-dates West Asian one by over 10,000 years. As I said, the first widespread use of ceramic utility wares were in Jomon Japan, which we know from ancient DNA tests belonged exclusively to hg C and D.
The Polynesian colonisation happened very recently, the last major expansion (to Hawaii, New Zealand, etc.) taking place only between 700 and 900 years ago. In contrast, haplogroup C is thought to have spread around Austronesia at least 40,000 years ago. That is the difference in time scale between C and O3. I wasn't quoting your examples of ceramics and swaddling but only mound buildings and burial types. The climate in Mediterranean Europe was at least as warm as in the Near East, especially mountainous Anatolia and the Caucasus. Besides, agriculture had arisen in cold and harsh northern China by 9000 BCE. 1) East Asian farmers would have to migrate all the way from China (the northernmost place in East Asia with agriculture in Neolithic time) to Mexico and the Andes. This alone seems unreasonable. Why would settled farmers suddenly shift back to a nomadic lifestyle and leave a fertile land for the harsh Siberia and Alaska ? 2) Those Chinese farmers should have managed to keep the knowledge of agriculture without using it for many generations during their long migration. Obviously they wouldn't have been able to bring their crops with them, and indeed no East Asian crop has been found in the Americas. So they would have needed to domesticate brand new crops in the Americas, with which they were utterly unfamiliar. This process would have taken many generations to select the right plants and use selective breeding to increase the size of the seeds. I would have been much easier for local Amerindians to achieve that than for newcomers who weren't familiar with the environment. 3) Neolithic Chinese farmers would have had domesticated animals (chickens, pigs), which they could have taken with them, but obviously didn't since none were found in pre-Columbian America, even in archaeological remains. 4) If all the above were nevertheless possible (extremely unlikely) and East Asian farmers had been the ones bringing agriculture to the American continent, we would expect that their population would have boomed compared to that of hunter-gatherers, like everywhere else in the world. Therefore their haplogroups would have to be dominant in places where agriculture developed. Yet, all Native Americans in places where agriculture developed (S-E USA, Mexico, Andes) belonged to Y-haplogroup Q, while Neolithic and modern Chinese belonged chiefly to O, with minorities of C3 and N. The Chinese also have a much greater diversity of mtDNA haplogroups than anywhere in the Americas. The split between East Asian and American subclades of hg A, B, C and D took place at least 10,000 years before the Neolithic. Last edited by Maciamo; 04-12-13 at 12:04. Agreed they are pushing back the dates of farming in Americas and East Asia but if I am not wrong the dates are around 10000 BC. 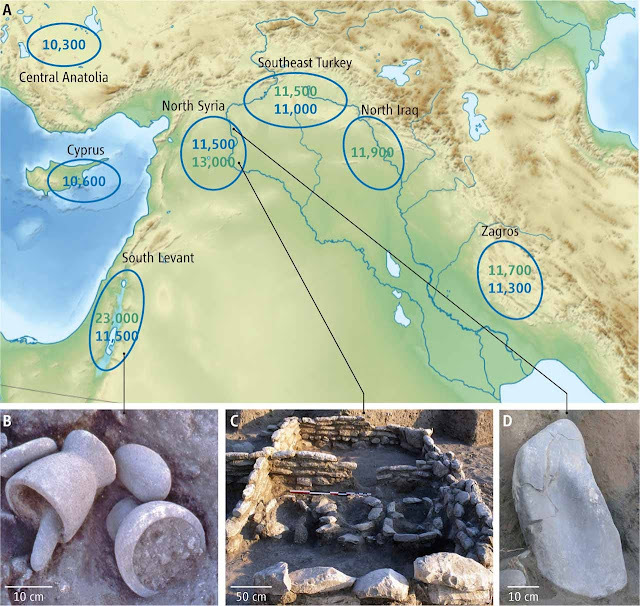 Time estimation for farming go as far back as 23 000 BC in the Near East.